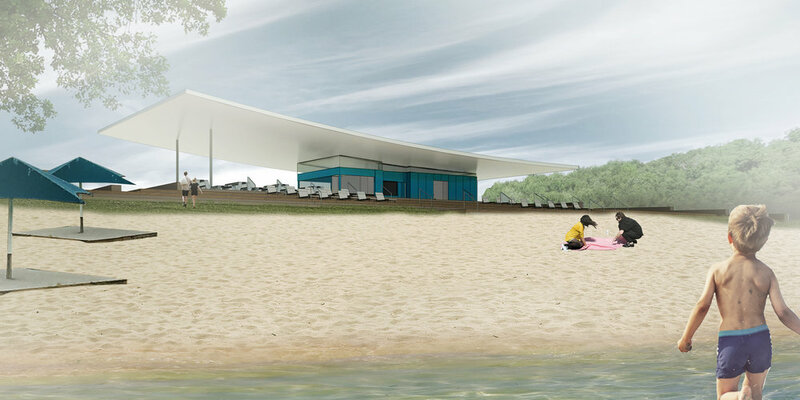 With Tidal, our team set out to design the unexpected, not simply due to the building’s unique function (a beach house in Kansas), but instead for its striking departure from traditional Midwest park forms. Although fundamentally basic in its CMU, polycarbonate, and concrete construction, its simple elements – plane roof and box below – provide important and essential needs, like shelter from the elements and sustaining amenities. It is a confluence – seamlessly merging all different community members and functions. Tidal’s subtly articulated, but sprawling terrace provides a place to socialize and sunbathe. It’s sweeping roof, which swells above, mimics the lapping waves nearby and gives refuge from the summer sun, while its clean lines epitomize the tranquility so many seek on the water. It is completely germane to its environment, while simultaneously standing out and announcing a bold future vision for the park and its role in the community.